A libertine's green limousine was lately seen in Saint Vereen. The libertine wore aubergine. In Saint Vereen they're not so keen on aubergine. The party scene in Saint Vereen is all crepe-de-chine and gabardine, beauty queens and Charlie Sheen. The libertine in aubergine moves between these beauty queens: his feet careen from scene to scene, taking in the magazines, the tall Marines, the jumping beans, the snarling face of Charlie Sheen. The libertine leaves Saint Vereen. Saint Vereen is not his scene--he likes a scene that's more serene. Vals-en-Deen is just that scene. He sights the sheen of Vals-en-Deen. Its woods are green; are tourmaline. With carabine, he'll hunt that green, the libertine in aubergine. The birds that preen in Vals-en-Deen are not quite serene when there's been seen in their woodsy green the libertine in aubergine. His carabine for them spells "fin." But when libertines in limousines leave Vals-en-Deen for Saint Vereen, those birds that preen are quite serene. Though the birds may vent their spleen, the libertine in aubergine suffers only improved mien when Vals-en-Deen is dimly seen from the dark windscreen of his limousine. Then, our heroic libertine, rid at last of Charlie Sheen, of magazines, of beauty queens, of crepe-de-chine and gabardine, bounces like a jumping bean, a jumping bean on too much caffeine, decked out in cloth of aubergine. About two years ago there was a meme going around in blogs, the aubergine meme. The goal was to end a poem with the word “aubergine”, a task as difficult as rhyming the word “orange” (try it). So I found this delightful poem in this awesome blog and I think, you’ll agree it’s the best aubergine poem ever. Three cheers to Reen for creating it. Another aubergine poem (okay, not really) is the recipe that follows. It’s the easiest thing to do with aubergines, far easier than writing a poem, not as elegant though. Feta cheese is never elegant, damn it. 2. Heat olive in a big frying pan. 3. Brush the slices of aubergine with the oil before placing the slices in the pan. Turn the slices of aubergine, to cook both sides. 4. Remove the pan from the heat, let aubergines cool a little. 5. Put feta, parsley, chives, pine nuts and garlic in a small bowl and stir. 6. 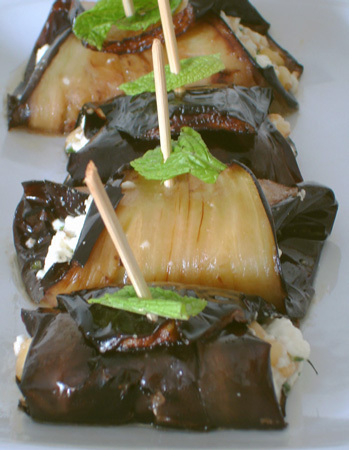 Take a slice of aubergine and place a tablespoon of the feta mixture in the centre of the slice. 7. Carefully roll the aubergine upwards. Place the aubergine roll on a baking tray before repeating the process with the 3 other aubergine slices. If it doesn’t remain sealed, secure it with a toothpick. 8. Place aubergine rolls in the oven for 5 minutes. Serve hot or cold. If you want you can make some simple tomato sauce and serve a spoonful on the side. This is a recipe that combines two or three recipes I found in the New Vegetarian Epicure by Anna Thomas and in the BBC recipes section (sadly, I had done this a long time ago and it seems I have cooked up the exact link). I had bought the Vegetarian Epicure when I was a student and needed to cook for myself, and I remember reading it at night in bed, like a novel. Because Anna Thomas writes so beautifully. All the recipes I have tried from her book are excellent and really really work. I made this for the magazine and after the shoot, we had some out in the balcony, under the sun. It is a recipe for summer lunches. Sift together flour and salt. Slice butter and drop the slices into the flour. Work the mixture until it resembles big breadcrumbs. Pour the cold water over the flour butter mixture and stir it in very quickly with a fork, until the dough gathers together. Form the dough into a ball, wrap it in foil and chill it for about two hours. On a lightly floured surface, roll the chilled dough out into a circle about 2 ½ in/62 mm larger than your quiche or flan tin. Roll the circle of dough round the rolling pin and unroll it over the tart tin, centering it as well as possible. Press the sides in against the rim of the tin, pushing the extra dough down, to make an edge slightly thicker than the bottom. Crimp the ridge of dough neatly just above the rim of the tin. Prick the bottom of the shell all over with a fork and chill the shell for 30 minutes. 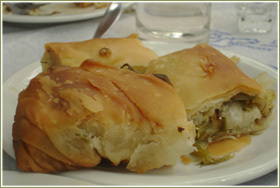 Line the inside of the shell with aluminium foil and fill it with dried beans or nuts so that the pastry won’t puff up. Bake the shell in a preheated oven at 450 F /230 C for about 8 minutes, then remove the beans and foil and bake for another 5 minutes until the bottom of the shell begins to colour. Allow the shell to cool slightly, then fill the tart shell with the filling. Heat olive oil in a pan and sauté zucchinis. 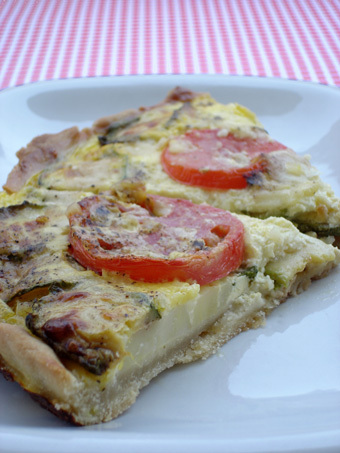 Layer potatoes, zucchinis and tomatoes in the pastry shell, season between layers and sprinkle with a little gruyere and basil leaves. Repeat, finishing with a layer of tomatoes. Beat together the eggs and cream. Season, stir in the remaining gruyere and half the parmesan. 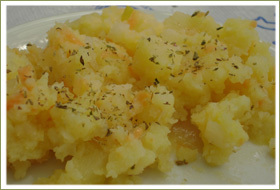 Pour this over the filling and sprinkle with the rest of the parmesan. Bake for 35-45 minutes, until golden and firm. Scatter with the remaining basil. Cool for 10 minutes before serving. I have been neglecting this blog and neglecting cooking in general, but I haven’t neglected eating. I had my Easter Holiday on Mount. Pilion, in Makrinitsa village and the food our hosts -Kostas and Elena- prepared for us was delicious. 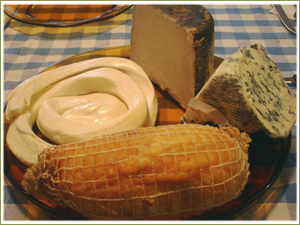 They had stocked the fridge with the most amazing cheeses which we devoured along with the best wines one can find in Greece. So a big thank you to our friends. Please invite us back, next time we'll behave. 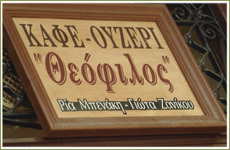 I want to confess I have a problem with most people who run taverns in Greek villages. Why can’t I find mushrooms, almost anywhere? Greece is full of mushrooms and some of them are rare and delicious. But somehow, they haven’t made it into the kitchens of professionals. I don’t know the reason to that, except maybe that people don’t like to experiment, and that they are content with a good old steak. Another thing that bothers me in Greek villages is the lack of homemade, lovely, savoury pies (not in Makrinitsa though, because we had a very nice leek pie in Theofilos café). Really, people are lazy. I want to find a village where people bake bread, make pies and cook mushrooms. And that’s not because I want to validate my village life stereotypes, but because that is what I look for in cities too. Real food, that sometimes takes more time and effort. 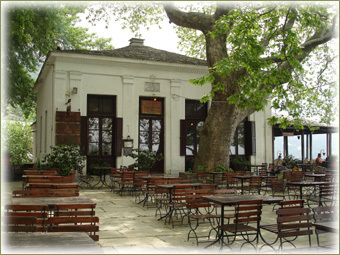 Theofilos cafe is one such place in Makrinitsa, where you can taste delicious food that a.is fresh and cooked with skill b.doesn't cost a fortune. 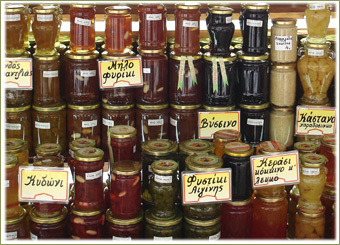 What most greek villages have though, is preserves. 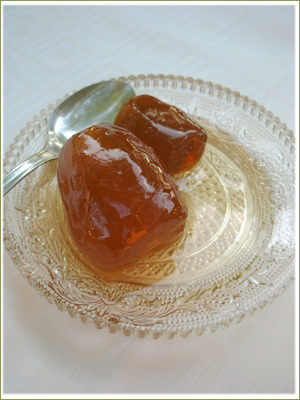 Usually, these are fruits that have been boiled in sugar and water, so they end up very syrupy and are stored in jars. Cherry, rose petals, orange, bergamot, fig, apple, grape and quince preserves, are the most common. But you can also find tomato preserves or aubergine preserves, and these are sweets! They go by the generic name “glyka koutaliou” that means spoon sweets, because you only have a spoonful (supposedly) with coffee or a glass of water. But you can very well use them to top your ice cream or yogurt, they are perfect partners. 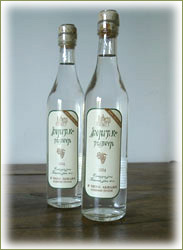 Another good thing you can find is tsipouro, a strong drink -that has nothing to do with ouzo- which if good, never gives you a headache. You drink it in little shots and always with food, especially, pickled or spicy food, like this baked feta with onions and peppers. when the sun is shining and it is even better when it is cold outside. 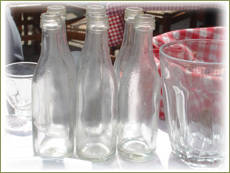 Here you can see some of the -come on, tiny!- empty bottles on our table. And this was just round one.